Champions in this category are individuals or organizations who have made a dynamic impact on the future direction of a manufacturing company or the manufacturing industry (more detailed Champions features can be found in the 2018 Champions Yearbook). 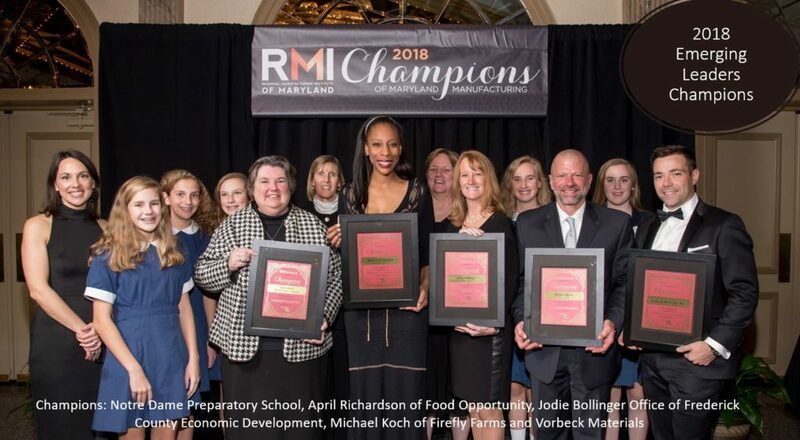 Prince George’s County’s April Richardson’s Food Opportunity company supports minority and women-owned companies in the food industry that wish to scale into manufacturing. She will be partnering with the City of Baltimore to hire and train formerly incarcerated persons in baking and coffee manufacturing. Jodie Bollinger, Director of Frederick County’s Office of Economic Development has been an advocate and voice for the manufacturing industry for over 20 years; she leads, bringing manufacturers together to learn from each other. Michael Koch leads Garrett County’s Firefly Farms and is also a mentor to fledging agribusinesses. Firefly Farms’ cheese is sold throughout the country having won over 110 national and international awards of excellence. Baltimore County’s Notre Dame Preparatory School’s STEAM program cultivates creativity, problem-solving and entrepreneurial leadership skills, inspiring young women to pursue STEM careers as a vehicle for positive change. Howard County’s Vorbeck Materials is a leader in research, design, development, and manufacturing of graphene-enhanced wearables, conductive inks, high-strength chemical-resistant rubber and composites, antennas, RFIDs, and next-gen batteries.